What is it, exactly, that saves the soul of a man? Many might reply that it is God’selection, or choice, of that man. Yet that’s simply not true. God in His election makes choice of men TO salvation, and that choice will not be thwarted, but "election to salvation" and "salvation" are not the same things. Otherwise men would be saved at the moment God makes choice of them, before the foundation of the world. Yet it’s clear from scripture that the elect enter this world "children of wrath, even as others" (Eph.2:3). Others might say that it’s the death of Christ in a man’s sted which saves his soul. To be sure, without His death, no one would be saved. Yet Christ’s death for His people, which secures, purchases, and guarantees their salvation, does not immediately bring salvation upon His people. Else all those for whom He died would be saved at the moment His work on Calvary was finished. Yes, He bought their salvation — but He bought it, and it’s His! The merit, the value, and the efficacy of what He did was not distributed immediately upon His death, but resides in His Person. The life Christ obtained for His people is never bestowed apart from Himself. A man will obtain life only when he comes into a living union with Him Who is Life indeed. Whoever a man may be elect or not outside of Christ, he is outside of life (I John 5:12), and the wrath of God abides upon him (John 3:36). How, then, does a sinner receive this life in Christ? Election, as we’ve seen, is unconditional — but salvation is not! There are conditions which must be met if a man ever comes to salvation: He must come to life in Christ through repentance and faith. According to II Thess. 2:13, God not only has chosen men to an "end"— "salvation"—but He has also chosen for those men the "means" to that "end"—"through sanctification of the Spirit and belief of the truth". Does it not follow then, that if God has unconditionally chosen some to salvation, and has also ordained that salvation be obtained only through repentance and faith, that God must do something to insure that those so chosen actually repent and believe? Perhaps such would not be necessary if men were falling all over themselves in a mad scramble to lay hold of life in Christ. But such is emphatically not the case! The elect of God by nature are in a state of utter inability and rebellion towards God. Their salvation has been ordained by God the Father from before the foundations of the world. Their salvati on has been secured and purchased by God the Son on Calvary’s cross. But for their salvation to be actually obtained and realized, a work of God the Holy Spirit must ensue that "irresistibly" brings them to repentance and faith in Christ. Of what use is this doctrine? It reminds us, first of all, where life is found—not in a work of man, neither in believing a doctrine, nor even in an eternal decree, but in the Lord of Life! Consider II Tim. 2: 10: "Therefore, I endure all things for the elect’s sake, that they may also obtain the salvation which is in Christ Jesus with eternal glory." Paul is suffering the things he suffers because he knows that the elect, though chosen to salvation from the foundation of the world, must OBTAIN that salvation which resides in Christ Jesus. It’s clear from scripture that all men are given an offer of life should they truly believe in Christ (e.g. John 3:16). All men MAY come in faith to Christ—they have permission-but who WILL come? Because all men share the same contempt for God and His Son, no man, on his own, will come to Christ. Read John 6:44–45 very carefully. 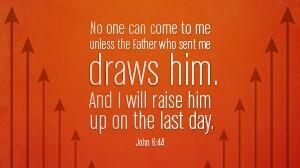 It is stated that none "can" come to Christ except they be "drawn". Many people believe that to some extent. They believe that apart from the convicting power of the Holy Spirit, no one will come to Christ. But they also believe that this "conviction" may well be resisted and thwarted by man’s stubborn will and rebellious nature. That’s NOT what this passage is saying! The word is "draw", not ‘woo".Go to a well and see if you can "woo" a bucket of water to the top! This is plainly speaking of something which effectually brings a sinner in faith to Christ. To say that it’s "irresistible" does not mean that the sinner does not resist this working. It simply means that the Spirit of God overcomes and conquers the resistance met in the heart of the sinner. What is the nature of this "drawing"? Perhaps you have the mental picture of the Hand of God laying hold of a lost sinner and: dragging him, kicking a nd screaming, into the Kingdom of Christ against his will. Get rid of that silly notion once and for all! The next verse makes clear that they are drawn by being "taught". God supernaturally opens the sinner’s blind eyes to see his great need of the Savior . Such a man is made willing, and freely chooses to come to Christ. In fact, he’s desperate for Christ and storms the Kingdom! This is not an "attempt" on God’s part, or God "trying" to talk man into something which he may, or may not accept—for the passage states that "every" one of those so taught of God comes to Christ. Why teach this doctrine? It reminds us once again that ALL of salvation is of grace. Knowing that those saved must believe and repent, I might be tempted to think that those things are my contribution to the work of salvation. But this doctrine makes it clear and plain: Yes, the sinner must meet certain conditions to be saved, but he will do so only as he is "given" the grace to do so (cf. John 6:65). Perhaps the most needed lesson we are taught by this doctrine is that there is something that goes on in salvation which only God can do. Because the things which men do in coming to salvation (e.g. repenting, believing, coming to Christ) are things which we can see with our physical eyes, and the working of the Holy Spirit in a man’s heart is something we cannot see, the tendency is always present to confuse the cause for the effect and the effect for the cause. Consider the Prodigal Son: He changed his mind about his father and his sin; he made a decision to go home; he actually arose and came home pleading mercy; and he actually found mercy from his father. We might be tempted to see these actions on the part of the son as the cause and reason of the mercy he receives. But his father was not confused about cause and effect. For he declares, "this, my son, was dead, and is alive again; he was lost, and is FOUND". We didn’t SEE anyone FIND him, as with the shepherd who sought and found his sheep, or the woman who swept her house until she found her coin. But just because we didn’t SEE it, doesn’t mean that it didn’t occur! The Holy Spirit’s work is indeed like the wind-We see it and know it, not directly, but by its effects. One result of this confusion about cause and effect has been to imply that salvation can be obtained by "imitating" the experience of others — i.e. Do what they did, kneel where they knelt, and pray what they prayed, and you’ll be saved too! Today we have thousands walking isles, kneeling at "prayer altars", and parroting the "sinner’s prayer". They are told that because they’ve done these things they’re saved and never to doubt it. Yet scripture declares you MUST be born again to ever see or enter the Kingdom of Heaven! Nothing in the universe "births" itself of its own will. Neither is the "New Birth" of a sinner the production of man’s will, but the result of the will and power of God (cf. John 1:12 13; James 1:18). Faith and repentance are not the causes of this new "creation," but the consequences of it! They are the inevitable responses of a man who’s been raised from spiritual death to spiritual life. The bottom line of the matter is this: In salvation there’s simply no substitute for God! He must work, He must draw, He must change, He must empower! With men these things are impossible. Yet with God, all things are possible!